If there was some divine creator, it was very cruel of him to make beauty boring. By beauty, I mean pure beauty: the untainted, excessive pleasantness which swans itself before us like some untouchable ideal form of being. We look at beauty and think “wow, isn’t it nice?” before turning away. It’s unattainable, it’s unrelatable and it’s boring. Boring boring boring. Hireath is an album consumed by beauty and sadness, and it’s often unclear which direction the scales tip. In the past, Olan Mill’s albums might be accused of leaning very slightly to the former. This might not really be his fault -not that it really matters from our end- as the modern-classical/ ambient field he calls home is oversaturated by the pleasant and forgettable, but apart from a great effort with Paths his tone has frequently passed just out of reach from relatability. Hiraeth looks to change this. Take the untranslatable title for instance: roughly equating to homesickness for a place to which you cannot return. Pleasantness has no home here. For such a moving album, it’s surprising to look back on it and struggle to find anything particularly new or dramatic. Compositions are kept fairly low key, with any personal flourishes kept to a minimum. What isn’t so surprising is the duo’s absolute mastery of every style they attempt. For example, opener “Neutrino” might seem familiar to any fans of Adam Wilzie’s various projects with the ever-effective blend of string sections and warm organ tones, but the addition of mournful, abandoned female vocals helps complete the track by feeling like another onlooker lost in its depths. Similarly, follow up “Echo of Tomorrow” sticks close to a traditional, drawn out swell of strings but couples it with a darker taint of low-end moans and sighs. 14 minute long “Nature for Equal Rights” may as well occupy an entire review by itself, since Olan Mill depart from their typically emotional, broad wash for a sharp, narrative style. The first few minutes of soft, drone contemplation soon give in to a much more substantial piano-led build up. At times sweet and at others ominous, the duo use this piano to keep the piece moving but flesh out the high and low ends with a misty, foreboding mix of strings. For all this lead-up, the listener is treated to the most cinematic tone even to set foot in an Olan Mill LP, as violin breaks through like a ray of sunlight in a storm. The result is expectedly uplifting, and it’s made all the more powerful by the seven minutes of preceding reflective drones. 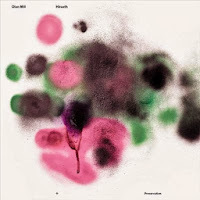 Hiraeth sees Olan Mill at their most personal and powerful, and makes another excellent addition to a quickly expanding discography. It’s an album which perfectly reminds us of the beauty to be found in solemn window gazing: the silver lining to what would otherwise be a very sad day. By fighting the urge to strive for beauty alone they’ve made an album with a staggering amount of impact, and Hiraeth is sure to hold a firm place in my playlist for many gloomy days to come.